The history conceals as to where and how the spoon was invented. Beyond all doubt, it has the same ancient age as the one of the first tool - a knife. During prehistoric times, large shells of nuts served as spoons. Later, spoons were made from bone material. Ancient Egyptians used bronze spoons, whereas Greeks preferred spoons that were made from silver. In ancient Russia, the wooden spoon has already become quite a habitual tool; which is evident from annals "Tale of Bygone Years" (XII century). In the old days, people used to carry their personal spoons and knives everywhere. They used to say: "Provident guest does not come without his own spoon". Wooden spoons were also widespread in Mexico and in medieval Europe. Russian wooden spoons were made from an aspen, birch, maple and Cedar. The tradition of using Cedar Spoons has been carried into our modern times. Cedar spoons are not only beautiful, but they are also made from ecologically friendly material. It is not only safe to use the Cedar Spoons, but it is also beneficial for health. For a reason, since the dawn of time Russian people used Cedar tableware and flatware and were very healthy till their old age. By consuming food using Cedar Spoons, one's organizm also absorbs the phytoncids and healthy resins present in the Cedar Wood. Cedar Spoon, unlike metal one, does not oxidize food or saliva. Therefore, it promotes optimal digestion and settling of the food in the stomach. It is recommended for toddlers, whose teeth have just come out, to gain their first eating skills using Cedar Spoons. It was noticed, that children enjoy biting and scratching aromatic Cedar Spoon with their baby teeth, and by doing so absorbing healthy elements present in it. However, the above mention benefits are not the only valuable qualities of the spoons made from Cedar. Even the simplest food becomes a hundred times tastier and full of aroma, when it is consumed using Cedar Spoon. Besides, eating hot meals with it would protect gentle mouth areas from getting burnt, since wood does not heat up like metal does. 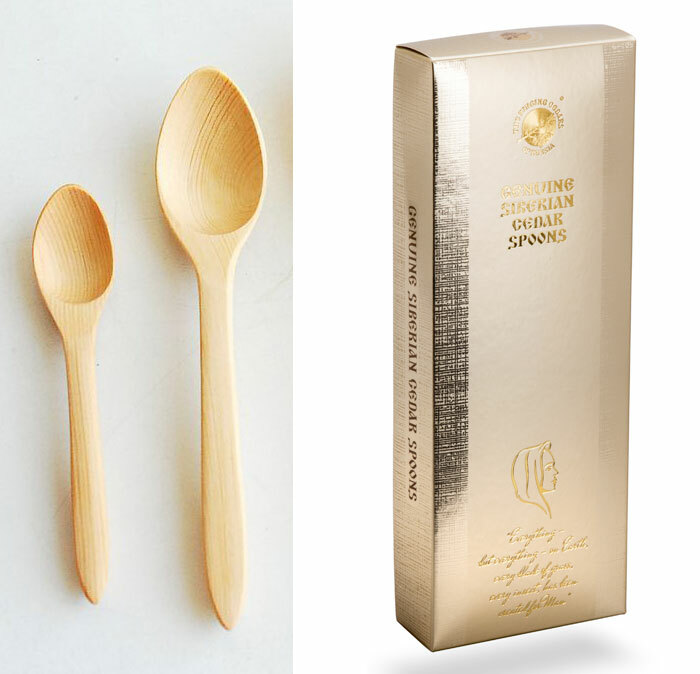 By making Cedar Spoon as an every day eating companion, one takes care of their health!